Kennels create a secure place for your dog. The term “kennel” may refer to either a cage or crate, typically used indoors, or an outdoor fenced area designed especially for your dog. It can be an important part of your dog’s life, especially if you have a puppy that might get into mischief if she’s left to her own devices all the time, or if you’re gone a lot and you want to keep your pal safe. 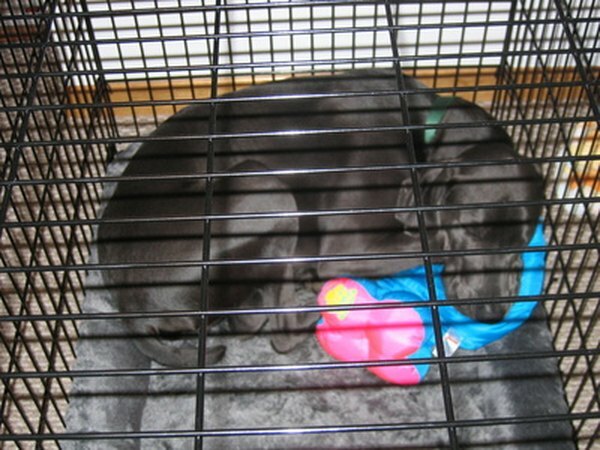 A kennel can also be an important housebreaking aid, when used correctly. An outdoor kennel, also called a dog run, should have sides that are tall enough to keep your dog from jumping out and high enough to keep other animals from jumping in. A 6-foot fence is usually high enough, but not always. Dogs that climb can almost always get over a fence no matter how high you make it, and very small dogs are at risk of being grabbed by flying predators such as hawks and owls, even if you live in town. Adding a top to the kennel prevents such problems. Large, active dogs need more space than smaller dogs. The American Society for the Prevention of Cruelty to Animals suggests dog owners use one of two sizes, either 10 feet by 10 feet or 5 feet by 15 feet. Making a kennel even longer than 15 feet helps to keep large, active dogs happy, and in many cases you can buy panels to add to a kennel kit that will allow you to make the kennel as long as you wish. Kennels are rarely narrower than 5 feet, even for small dogs. Your dog should be able to stand up, lie down and turn around in her indoor kennel or crate. 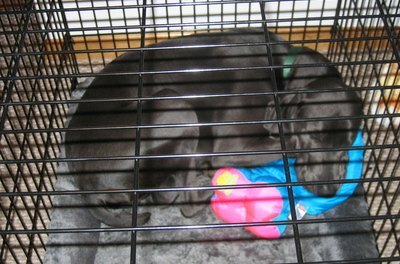 If you are buying a kennel for a puppy, get one that is large enough to suit her adult size. She’ll do her best not to soil her new den, but if she has too much room she might use one part for sleeping and another area to relieve herself, so block off the extra space until she needs it. A wire crate is often the best choice for this situation, since you can buy panels to control the kennel’s inner size. The exact dimensions of dog kennels will vary by manufacturer. In general you want a small kennel, 18 inches long or so, for toy dogs such as a Maltese. Kennels that are about 2 1/2 feet long are suitable for dogs up to about 40 pounds, including cocker spaniels, while basset hounds and other dogs up to about 70 pounds do best in a kennel that is around 3 feet long. Larger breeds, including German shepherds, and giant breeds, such as Newfoundlands, need much larger crates if they are to be comfortable in them. You can find crates that are 42 to 54 inches or longer that will suit these bigger dogs. Can Hookworms in Dogs Cause Vomiting Blood or Blood in Stool? What Size Kennel Does My Dog Need?